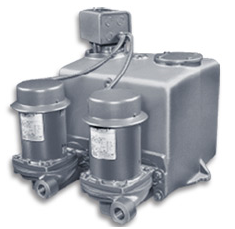 As a leader of pump and motor sales in New York we carry only the top of the line condensate pumps. A condensate pump is a specific type of pump used to pump the condensate (water) produced in an HVAC (heating or cooling), system back to a boiler or waste line. Condensate pumps are also used specifically to collect and transport condensate back into a steam system for reheating and reuse, or to remove unwanted condensate from an HVAC or appliance collection pan. The recovery of condensate from these pumps helps to reduce costs associated with the production of steam. In operation, these pumps tend to run intermittently, switching on once a connected basin or tank has filled with condensate to a certain point.